a Thermal spring a Thermal spring total C supply originates with transport of material from upstream (<1%), or as primary production by river phytoplankton (5.4%) and periphyton attached to macrophytes (1.5%). Production by aquatic and terrestrial macrophytes in the littoral regions and floodplain, and litter inputs from the flooded forest, collectively account for approximately 90% of C production, and so river-floodplain interactions appear to be of far greater consequence than events within the channel. Findings from the Orinoco flood-plain were similar: forest litter represented 27% and macrophytes 68% of total C sources, and inputs from phytoplankton and periphyton production together contributed only 2% (Lewis et al. 2001). In a sixth-order blackwater river in Georgia, river channel GPP accounted for only about one fifth of total inputs, which were dominated by floodplain organic matter originating in extensive riparian swamps of up to 1-2 km in width (Meyer and Edwards 1990). A synthesis of 36 organic matter budgets from six different biomes reveals distinct trends related to landscape controls of inputs (Webster and Meyer 1997). A principal components analysis of major budget components categorized streams along a first axis that was positively correlated with litterfall and BOM, and negatively correlated with primary production; and a second axis that was strongly correlated with POM and DOM concentrations, and thus organic matter transport (Figure 12.11). Small mountain streams cluster in the lower right of Figure 12.11, sharing the characteristics of high litterfall and BOM, and low GPP. Lowland streams have much higher organic matter concentrations and thus greater transport, and arid-land streams fall at the opposite end of the first axis with high GPP and low litterfall and BOM. 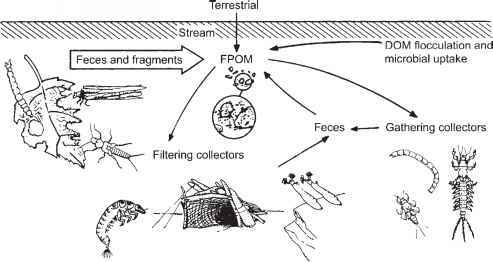 Thus, climate, terrestrial biome, and position along the eleva-tional gradient can be seen to be important underlying controls on stream organic matter budgets.